Surrounding communities, including Argo, Cedar Mount and Ayres, had colonial settlers before Clay. Ayres is on the north end and most of it is is now inside the city's borders. Zomora Lake is in that area, although it is right outside Clay's city limits. Based on records of the Presbyterian Church, the earliest documented settlers in Ayres arrived circa 1806. According to one book on the history of Jefferson County, Mt. Calvary Presbyterian Church is the oldest church congregation in the county that still holds meetings. 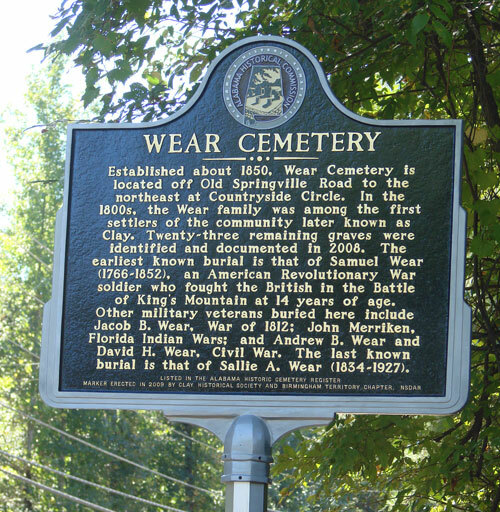 The church cemetery has a marker noting its historical value. The cemetery is known locally as a good source for geneology research. Some of the graves have only a rock as the marker. People from Cedar Mount, a little west of what is now Clay, wandered over to what is now the intersection of Clay-Palmerdale Road and Old Springville Road. At first, the area was called Shiloh's Beat. Clay United Methodist Church, origionally Shiloh's Methodist Church, met in this area. Churches were the only institutions and therefore served as a means for social interaction and mutual support. Schools were housed in the churches. Other churches sprouted, and more people migrated to the area. 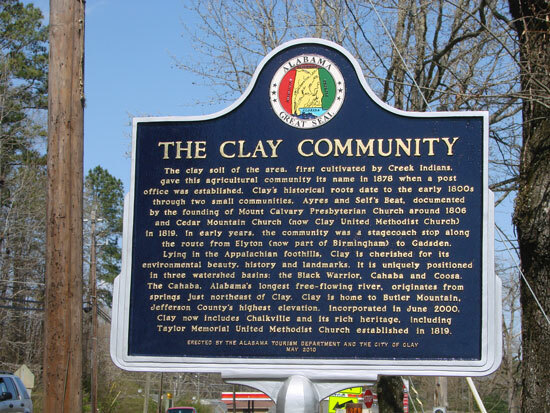 Meanwhile, the community of Chalkville was also attracting settlers who formed churches. Later, stores came to Ayres, Clay and Chalkville. Revolutionary War solder Samuel Wear settled in Clay by way of Cedar Mount. Many of his decendants are still here. 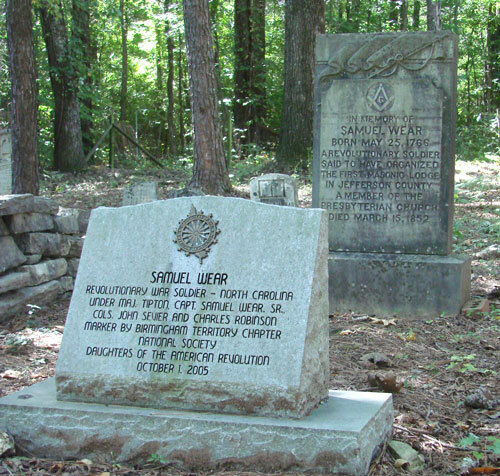 His grave is in an 1800s cemetery that has a marker for its historical value. Some of his decendants spell their name "Ware." Other families that trace their ancestors to Clay's early history are the Selfs, Goodwins, Chandlers, Holmes, Tuckers, Sellers, Moores, Buckners, Fraziers, Taylors, Claytons, Pearsons, Perkins, Chamblees, McClendons, Hicks, Wades, Vanns, Carlisles and Taylors.